Senior Wesley Lu, the only male cheerleader on the pep team in 17 years, performs a toe touch, a cheerleading stunt. Standing amidst a shower of purple confetti, three rows of cheerleaders performed synchronized movements in high-ribboned ponytails and short skirts—all except for one. Wearing long purple pants and a matching uniform shirt, Diamond Bar High School senior Wesley Lu stood in the center of the group, waving and cheering into a megaphone. In the Branding Iron game this year, Lu made his official debut as the first male cheerleader on the pep team in 17 years. Even though Lu had interest in joining the team ever since he came to DBHS, his full academic schedule always prevented him from doing so. He also felt as if he didn’t actually have enough skills to cheer, but after meeting DBHS class of 2016 varsity song captain Brandy Baker in his beginning dance class sophomore year, Lu gained confidence and was further inspired to join cheer. When he had an opening in his schedule his senior year, he leaped at the opportunity to try out for the team. He was later named one of the JV pep captains along with freshman Alexis Chandler. While his friends were supportive of him being a cheerleader, Lu also faced stigmas as a male cheerleader. On the day of his tryouts, Lu recalled how some male students laughed at him as he walked past with the other female cheerleaders. As a male cheerleader, Lu also faces higher expectations about his physical strength and is working to perform difficult stunts such as the one-man stunt, a move where the base lifts the flyer into the air and holds the flyer’s feet. 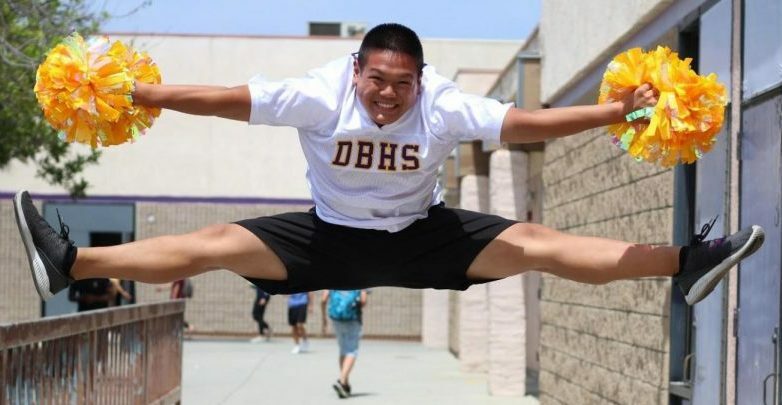 Over the summer, Lu attended the United Spirit Association cheer camp at Chapman University with the DBHS pep team, where he learned over 15 cheers and various stunts. The first day there, he and his team had to perform the DBHS fight song on the spot. Lu describes his experience as one of the highlights of his cheer career. “Putting your all into one performance, being spirited, having your facials, being strong in everything you do—that really set why I wanted to be in cheerleading,” Lu said. Although Lu still has many obstacles to overcome in his first year as a male cheerleader, he’s embraced his path and all the accompanying bumps in the road. He plans to continue cheering in college if he’s able to improve enough to be at the college level.